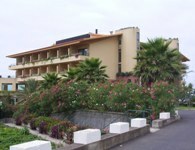 Hotel Monte Mar Palace is a new (ca.2001) luxurious 4-star hotel in Ponta Delgada, a small village near Sao Vicente. The hotel has 106 well-equipped rooms and 5 suites. The 2-person rooms are big enough for an extra bed. Junior suites for families wich children are available. Hotel Monte Mar Palace is undoubtfully one of the better hotels on the North coast of Madeira. Situated in a peaceful area on a cliff in Ponta Delgada, a small village between Sao Vicente and Boaventura in the fresher North of Madeira. Even in summer there may be showers and rain in this region. Witt its location directly at the sea, both the smimming pool and most of the hotel rooms offer stunning views on the beatiful coast and the Atlantic Ocean. Ponta Delgada is 65 km away from Madeira International Airport. The hotel can be found easily but keep in mind that the average driving speed on the coast road from Santana towards Porto Moniz won't be much higher than 30km/uur. Alternatively you may opt to take the highway towards Ribeira Brava. From there towards Sao Vicente and further in the direction of Santana. This will mean some more kilometers but much less time. 106 modern nicely decorated comfortable rooms. The hotel has 6 stages. There is a gymnasium, fitness room and heated swimming pool inside, a swimming pool with poolbar and a children's pool outside. Both outside pools reside near the edge of the cliff and offer a great view on the coast. Free beach chairs and towels are available. Just like most everywhere in Madeira, it is impossible to take bath in the sea. Two bars, one with live piano music, ensure a relaxing stay in hotel Monte mar Palace. You can site also remain outside to enjoy the sea breeze, while drinks can be taken from the bar. People who have come to Madeira to make adventurous levada walks will appreciate the laundry service of the hotel. Free parking is available in the quiet street in front of the hotel. The hotel makes many efforts to provide you with a nice stay in this rural, quiet village of Ponta Delgada. Live music and local dance groups ensure entertainment during the weekends. A wealthy breakfast, both continental and English breakfast is served in the big restaurant. The hotel is a lot bigger and busier than other hotels in our Madeira round trip so we had to get used to this. If you haven't rent a car, then it is advisable to book half or full board because there are no real alternatives in the village. Due to the day trips to Pico Ruivo and Pico do Arreiro, we choose to dine in the excellent (and cheap) restaurant ":Estrela do Norte" in Santana. Therefor we cannot comment on the kitchen. Hotel Monte Mar Palace is one of the better hotels on the North side of Madeira. It is alwo well known among Western tour operators. There isn't much activity going on in the village of Ponta Delgada. Therefor a car is highly recommended. For the same reason, it may be a good idea to book an All-Inclusive-holiday when staying for a longer period. The balconies are well seperated from the neighbours, but due to the T-shaped construction of the building, there may be a bit less privacy towards rooms at the other wing. We find this a good accommodation to spend a couple of nights and to explore the north coast of the island. Also please read the following remarks. Even in summer, the weather in the North of Madeira can be cloudy and rainy. If you want a guarantee for sunshine, then it may be a good idea to remain on the Northern side of the island. We used this hotel as our starting point for trips to Santana, the Pico Ruivo, Pico Arreiro, Ribeiro Frio and Balcoes. It will take about one hour by car to get from Ponta Delgada to Santana. Also note that the road becomes very narrow in Boaventura so watch out for trafic coming from the opposit direction. If you don't like driving, then you may find a hotel some closer to Sao Jorge or Santana. Because there aren't that much hotels in this area, it could be a good idea to think about renting a holiday home for a couple of days. 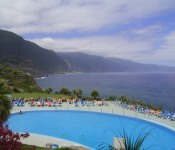 Many of them are situated in a rural environment and offer great views on the dramatic North coast of Madeira.